With today’s hair styles it is important for most men to find a hair care product that allows them to shape their hair into the trendiest styles and then be able to hold that hair in place all day long. So, that means they have to look for the best hair wax for men. Here is a look at some of the more popular hair waxes on today’s market. Our research shows that the majority of the users for these products were satisfied and in lot of cases they came back to buy more. Water, Beeswax, Bis Diglyceryl Polyacyladipate 2, Petrolatum, Cetearyl Alcohol, VP/VA Copolymer, Propylene Glycol, Ozokerite, Copernicia Cerifera (Carnauba) Wax (Cera Carnauba), Diethylhexyl Maleate, PEG 40 Hydrogenated Castor Oil, Vinyl Caprolactam/VP/Dimethylaminoethyl Methacrylate Copolymer, Parfum (Fragrance), Glycerin, Methylparaben, Amino Methyl Propanol, Propylparaben, Caramel, PEG 90M, Limonene, Linalool, Methylisothiazolinone, Hydroxyisohexl 3 Cyclohexene Carboxaldehyde, Butylphenyl Methlyproprional, Citral, Hydroxycitronellal, Coumarin, Citronellol, Geraniol. Reviews for TGIF Bed Head For Men Matte Separation Wax are extremely positive with most people really feeling that it supplies their hair with the hold they need. Long Lasting: The majority of men find that it lasts all day, keeping their hair styled perfectly. Good in Humidity: Unlike many other hair waxes that melt leaving hair to wilt in humid conditions, this Bead Head wax holds up even when humidity becomes a problem. Washes out Easily: At the end of the day, this product washes out easily with just normal shampooing. Water, Lanolin Wax, Cetearyl Alcohol (* Coconut), Glycerin, Tribehenin, Beeswax, Tridecyl Stearate, Ceteareth 25 (* Coconut), Tridecyl Trimellitate, Alcohol Denatured (* Grain), VP/VA Copolymer, Dipentaerythrityl Hexacaprylate/Hexacaprate, Tea Tree Leaf Oil, Acrylates/C10 30 Alkyl Acrylate Crosspolymer, Bentonite (CI 77004), Benzophenone 3, Green Tea Leaf Extract, Salvia Hispanica Seed Extract, Nettle Extract, Comfrey Root, Chondrus Crispus Extract, Elderberry Flower Extract, Coneflower Extract, Triethanolamine, Tetrasodium EDTA, Fragrance (Parfum), Benzyl Benzoate, Benzyl Salicylate, Citral Eugenol, Butylphenyl Methlyproprional, Limonene, Linalool, Hydroxyisohexl 3 Cyclohexene Carboxaldehyde, Methylparaben, Ethylparaben, Propylparaben, Butylparaben, Isobutylparaben, Phenoxyethanol, Mica (CI 77019), Titanium Dioxide (CI 77891), Iron Oxides. 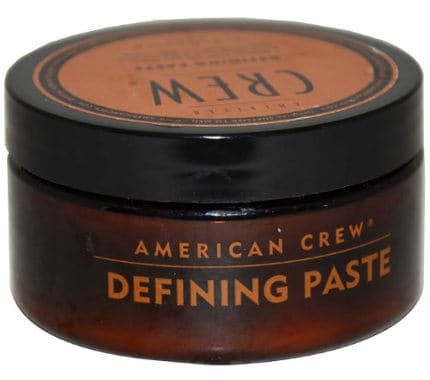 Reviews for the American Crew are quite positive, especially among those users who need a minimum to medium hold for their hair style. While a few users do feel that this hair paste can leave hair with sticky residue or feel a bit greasy, most users find that it works well on their hair when trying to hold a style. No Wet Look: People like the fact that this American Crew defining paste doesn’t leave their hair shiny or looking wet. Doesn’t Harden on Hair: They also like that it doesn’t leave hair feeling hard or stiff and it washes out easily. Adds Texture to Hair: One of the reasons users give for using this product is the fact that it gives their hair some much needed texture. 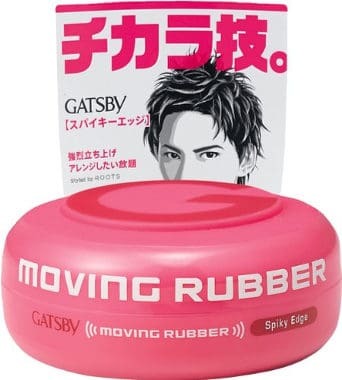 Manufactured in Japan, Gatsby Moving Rubber Spiky Edge Hair Wax is one of the best hair waxes for Asian hair although it works well for styling most short hair styles. Water, Euphorbia Cerifera (CANDELILLA) Wax, Ethylhexyl Palmitate, Parrifin, Cyclopentasiloxne, Ceteth-20, Mineral oil, Mocrpcrystalline Wax, Sorbitan Stearate, Butylene Glycol, Alcohol, Stearic Acid, Stearyl Alcohol, PPG-10 Sorbitol, Trietrhanolamine, Caprylyl Glycol, Dimethicone, Carbomer, Fragrance , PEG-90M, Panthenol, Polyquaternium-11, Red 33(CI 17200). 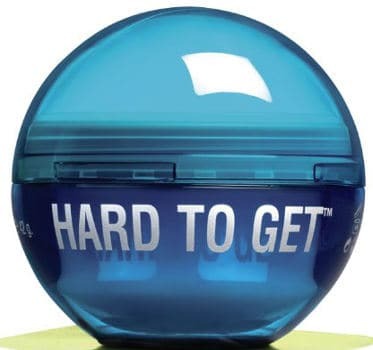 Works Well For Tough to Style Hair: Users find that this hair wax works well for those who have difficult to style hair. It works both for limp fine hair and thick hair. Great Hold: People also find that it holds well all day while still allow your hair to have some movement. Many men want a strong a hair wax that will hold their hair style all day while still leave their hair touchable. 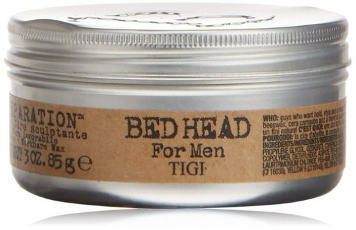 Tigi Bed Head Hard to Get Paste promises you that firm hold without sticky hair feeling. Comes in a 1.5 ounce container. 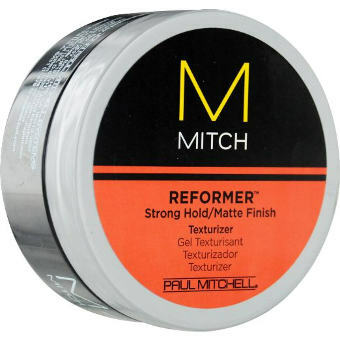 Provides a strong hold with a light matte finish. Consumers should note that this paste does not contain any parabens and therefore safer to use than some other hair waxes on the market. Good Hold: Users feel this paste holds their style in place all day while looking quite natural. Adds Volume: Men with thinner hair like the fact that this hair wax adds volume making their hair look thicker and fuller. Leaves Hair Touchable: Users also like the fact that this wax/paste doesn’t leave their hair feeling sticky or hard, but rather touchable soft. Comes in a 3.4 ounce container. Best when used in towel dry hair. Water/Aqua, PEG-40 Hydrogenated Castor Oil, Stearyl Alcohol, Tribehenin, PVP, Petrolatum, Hydrogenated Stearyl Olive Esters, Polyacrylamide, Dimethicone, Oleth 10 Phosphate, C-13-14 Isoparaffin, Phenoxyethanol, PEG-150 Pentaerythrityl Tetrastearate, Fragrance (Parfum), Methylparaben, Sorbic Acid, Laureth 7, Propylparaben, Disodium EDTA, Panthenol, Potassium Hydroxide, Hydrolyzed Wheat Protein, Hydrolyzed Wheat Starch (05251/1). 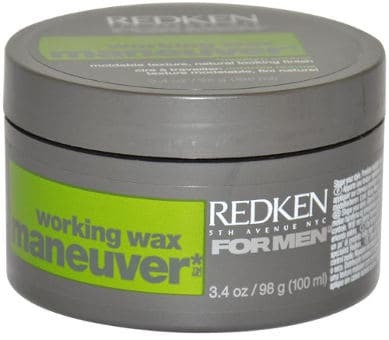 Great Hold: Some users use this wax to keep their mohawks standing straight up. Easy to Apply: The creamier texture of this hair wax makes it easy to apply to your hair without the wax clumping. Adds Body: Several users also feel that this wax adds body to their flat lifeless hair. If you like the tossled hair look, but want that look to remain in place then Osis by Scwarzkopf is designed for keeping your hair looking natural even when you worked hard to create the windblown look. This is a matte gum paste. Although this hair paste does contain petrolatum it does not contain any parabens. 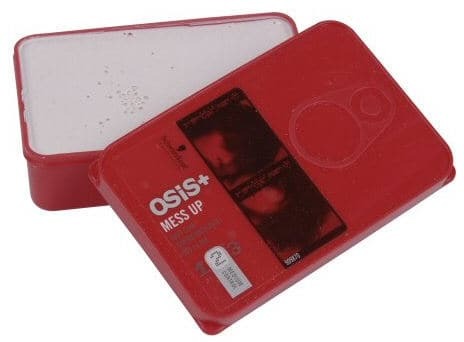 Reviews for this Osis Mess up hair wax are very positive with the biggest complaint being that some users don’t like the fact that this paste leaves your hair looking slightly wet or damp but great for those who like the damp look. However most users experience the following benefits when using this wax. Holds Well: For those who don’t a need a firm hold for their desired hairstyle this wax provides a good hold according to most users. Fuller Looking Hair: Users also find when using this paste their hair looks thicker and fuller and who doesn’t want a head full of hair? Comes in a 3 ounce container. As noted in the features this hair wax is paraben free for those men who are trying to avoid the use of products containing parabens. Great Hold: Users find that this hair wax holds their hair long or short in a variety of styles from that spike look to a more refined gentlemanly look. Looks Natural: Users also like that this hair wax looks natural once it is applied so that most people don’t know they are using any styling product. Washes Out Easily: This hair wax also washes out of the hair easily with a simple shampooing. If you are looking for a product to hold some of today’s newest hair styles, then finding the best hair wax for men just might be what you need to hold those hairs in place.